This fall we are offering two new classes that our readers would no doubt find are about topics that we write about on a regular basis. The classes are Radical Sustainability and Confronting Racism and White Privilege. In the Radical Sustainability class we will investigate the growing popularity of sustainability or what would more accurately be called Green Capitalism. What does it mean to be Green? Can we purchase our way out of environmental destruction? 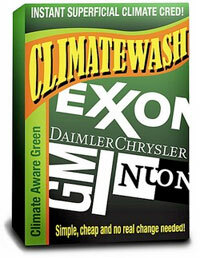 What is Greenwashing? We will not use a book for this class, rather a collection of articles, web pages and videos to have greater understanding of the idea of sustainability. We will also collectively create a vision or set of proposals for what a truly sustainable Grand Rapids might look like. This class will be on Mondays from 7 – 9pm, staring October 4. The second class is designed to get participants to confront the issue of White racism & White privilege. As a primary text, we will use the book by Tim Wise, Between Barack and a Hard Place: Racism and White Denial in the Age of Obama. In addition, we will look at how White Racism impacts other communities of color and issues such as immigration. Included in this class will be a look at the racial dynamics that exist in the Greater Grand Rapids area and what is or isn’t being done to promote racial justice. This class will be on Wednesday’s from 7 – 9pm, starting October 6. Both classes are for 6 weeks and the cost is $20. We will be hosting the classes in the Steepletown Center at 671 Davis NW in Grand Rapids. For more information or to sign up please contact Mike Saunders at outobol@gmail.com or Jeff Smith jsmith@griid.org. If you want to promote the classes you can forward this link and print or post the flyers for both classes.